Bang! Howdy is a free tactical strategy game set in the wild west from the same company as Puzzle Pirates. Like pirates, the wild west is a fun theme for a MMO or any online game. Unlike the pirate or even martial arts sub-genre, however, the wild west theme in a MMORPG or an online game has not been fully explored yet. 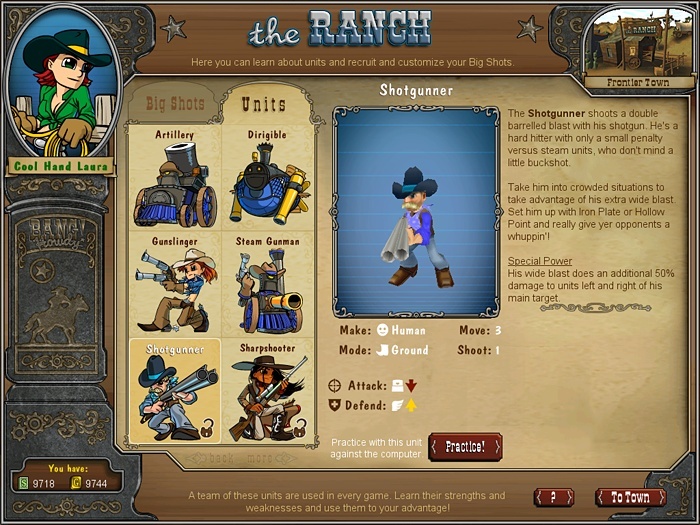 There was a wild west MMO in development in the past called Rush Online but it was never released in English. Thus, Bang! Howdy is essentially the only major (not in flash or text) wild west game in town right now. 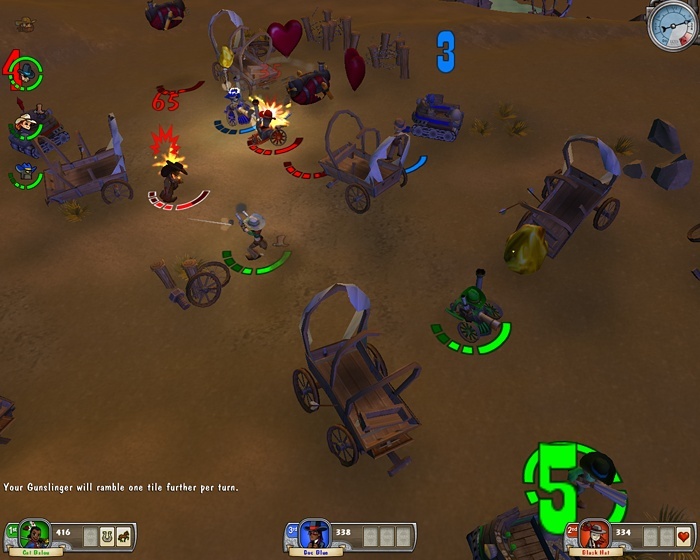 Players can experience the wild west by tracking down outlaws for bounties, shooting it out with other players, or forming gang and getting a hideout. Of course, the game is more of a MMORTS than a MMORPG but it is still a fun approach to a basically unexplored genre. Can be downloaded or played in your browser. One of the few MMOs/online games with a wild west theme. Players can form gangs and chat in their own Hangouts. Two major towns (a third is in development) with different themes: Frontier Town and Indian Trading Post. Bounties are a single player mode where player serve as deputies hunting down outlaws for currency, badges, and clothing. Up to 4 players per match. Players earn the game's currency at the end of matches. Comment: Bang! Howdy is sort of fun for a while. It stays that way until you figure out that its like a kiddie Fire Emblem but without the cool characters and the sweet satisfying feeling when you pummel an enemy of the cool characters. In my opinion, these companies are running out of good ideas! Oh well at least its mildly entertaining unlike RuneScape. Comment: Like Puzzle Pirates, I love the setting. Pirates and the Wild West are both great for games. I think there should be more wild west games because pirate games seem to finally be getting popular. However, the game is a little too cutey-pie for my taste to make it great. Not bad though. Comment: I have tested this game and it was really fun. Try it, folks! Bang! Howdy is free to play. The download is also free if you choose that option over playing in your browser. Free 3D action MMORPG by Acclaim that is intended for adults. Free 2D online game that focuses on training and racing horses instead of combat. 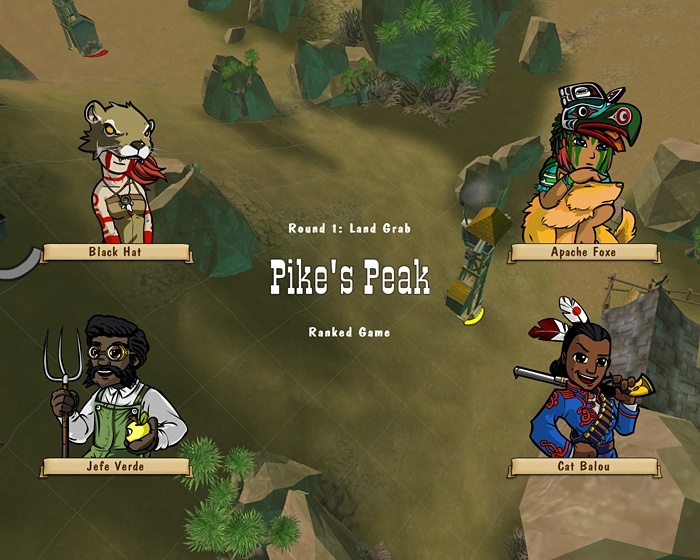 Multiplayer RPG that can be played on both the PC and Xbox 360 and has a non-linear storyline. 3D fantasy MMO sequel with a PvP focus that offers less grinding and better graphics than the original. Free browser-based graphical RPG that can be played on low-end PCs. Free 3D car combat MMO that blends action with strategy. Free action MMORPG where players can ride mounts into battles and guilds fight over strongholds. Free 3D MMORPG with anime-style graphics from the same company as Myth War and Voyage Century. Action-packed free MMO that is a combination of Diablo and World of Warcraft. Innovative Free MMO where players have their own families and can control up to three characters at once. Former pay-to play action MMORPG that is now free-to-play and boasts siege PvP warfare. Free online fighting game that combines the intense action of arcade classics like Tekken and Virtua Fighter with a great deal of character customization. Free 3D martial arts MMORPG by Acclaim that allows players to live out their Kung Fu fantasies. Free online shooter that has 3D graphics and a Team Battle mode with various missions to complete. Popular online real-time strategy game that can be played for free. Free-to-play fantasy MMORPG that boasts a unique pet/ally system. Highly anticipated expansion pack that makes the world's most popular MMORPG even better. Free MMORPG with a huge variety of pets, hand-painted graphics, and a very different combat system. Innovative MMO where role-playing is key and the players are in control, Face of Mankind. Major sci-fi MMORPG with both a pay-to-play and a free version, Anarchy Online. Science-fiction MMO that gives you considerable freedom in space, Eve Online. Retail RPG with free online play that won GameOgre.com's Best Gaming Value award for 2005. Free 3D MMORPG with a huge focus on action and a unique monster system, Thang Online. Popular MMO with cartoon graphics and several innovative features, Ragnarock Online.